If you're someone who’s looking to get into fantastic physical fitness while burning fat and building muscle, CrossFit is a workout variety to consider. CrossFit training is unique from other forms of training as it’ll have you working across a number of different fitness modalities, including cardio interval training, strength training using both weighted exercises along with bodyweight exercises, as well as gymnastics movements. Individuals who participate in this form of training are going to be fully challenged while keeping boredom at bay because of the ever-changing nature of each workout session. Let’s look at little closer at the specific elements of CrossFit and how you can go about structuring this workout into your own fitness protocol. Then, we'll give you some example workouts to try today! First, one of the main tenants of the CrossFit workout style is that it utilizes compound or functional based movements. These are exercises that are going to be highly applicable in day to day movements so by performing them in your workouts, you’ll see great strength improvements when going about daily life. Examples would include squats, lunges, push-ups, pull-ups, shoulder presses, kettlebell swings, renegade rows, and kettlebell windmills. The more muscle fibers you can work in an instant with this workout protocol as well, the more calories you will burn and the greater fat burning hormonal release you will see. This is one primary reason why CrossFit training tends to be so highly effective for those seeking fat loss results. Next, any good CrossFit workout session also needs to have a rapid rate of progression through the workout as well. This means that there is very little downtime between exercise – and in some cases, none at all. CrossFit often includes workouts where you do ‘AMRAP’, performing as many reps as possible of an exercise in an allotted time period. To progress these types of sessions, you then increase the total number of reps completed in coming workout sessions. Since CrossFit style of training is very much based upon workout timing, this means that you need a means of keeping track of your total time elapsed very easily. 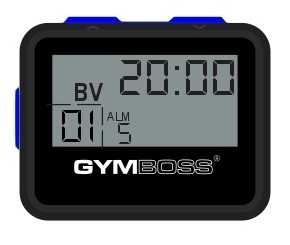 A CrossFit timer, such as the Gymboss CrossFit Timer, work exceptionally well here as they will be a hands-free solution that will instantly let you know when it’s time to move onto the next exercise. While you can just watch the hands on a clock on the wall, that can be quite distracting during the workout, taking away from the intensity you’re able to complete it with. Using your Gymboss as your CrossFit timer eliminates this issue. Finally, the last requirement of CrossFit training is that the sessions are very short, but yet very intense. It’s the intensity in which CrossFit is performed with that bring about the many different benefits that you’ll see. Intensity with CrossFit comes from both the rapid movement from exercise to exercise along with the utilization of so many muscle fibers through both resistance and bodyweight exercises. Then you add in the brief cardio intervals for muscular endurance in there and you have one of the best-rounded workouts available. So if you want to see fast results and improve your fitness level, make sure that you give some consideration to CrossFit. Perform it in the comfort of your own home along with a Gymboss, functioning as your CrossFit timer, and you will be on your way to seeing dramatic fitness enhancement. ~ Set your Gymboss for one interval of 1:00 for 30 rounds. Each time it beeps it's time to start another circuit.